Weipa /ˈwiːpə/ is a mining town on the Gulf of Carpentaria coast of the Cape York Peninsula in Queensland, Australia, and is the largest town on the Cape. At the 2011 census, Weipa had a population of 3,334; the largest community on Cape York Peninsula. It exists because of the enormous bauxite deposits along the coast. The Port of Weipa is mainly involved in exports of bauxite. Over the last decade or so[when?] there have been occasional shipments of live cattle from the port. Weipa is just south of Duyfken Point, a location now agreed to be the first recorded point of European contact with the Australian continent. Dutch explorer Willem Janszoon, on his ship the Duyfken, sighted the coast here in 1606. This was 164 years before Lieutenant James Cook sailed up the east coast of Australia. In 1895 Presbyterian missionary Reverend Nicholas John Hey established a mission at the junction of Embley River and Spring Creek which he called Weipa, which is believed to derive from the Anhathangayth word meaning fighting ground. In 1932 the mission relocated approximately 28 kilometres (17 mi) to Jessica Point continuing under the same name. Very restrictive legislation was enacted by the state of Queensland in 1911, making the Protector the legal guardian of every Aborigine and half-caste child (until he/she was 21), and the right to confine (or expel) any such person within any reserve or Aboriginal institution, and the right to imprison any Aborigine or half-caste for 14 days if, in the Protector's judgement, they were guilty of neglect of duty, gross insubordination or wilful preaching of disobedience. It also gave powers to the police to confine Aborigines to reserves to "protect them from corruption". This latter power was given by Comalco[clarification needed] in 1957 to justify the removal of Weipa Aborigines. In 1932 the community had to relocate to its present site, at Jessica Point now called Napranum because of malaria. It is about 12 kilometres (7.5 mi) south of the present town of Weipa. At this time most of the people were Awngthim but soon different tribes and clans were brought from Old Mapoon (when the people were forcibly removed and the settlement burnt down on 15 November 1963), and other communities. In 1955 a geologist, Henry Evans (1912–1990), discovered that the red cliffs on the Aboriginal reserve, previously remarked on by the early Dutch explorers and Matthew Flinders, were actually enormous deposits of bauxite – the ore from which aluminium is made – and to a lesser extent tungsten. The "Comalco Act of 1957" revoked the reserve status, giving the company 5,760 square km (2,270 sq mi) of Aboriginal reserve land on the west coast of the Peninsula and 5,135 square km (1,933 sq mi) on the east coast of Aboriginal-owned (though not reserve) land. Mining commenced in 1960. The mission became a government settlement in 1966 with continued attempts by Comalco to relocate the whole community elsewhere. The company then built a new town for its workers on the other side of the bay. Weipa has a tropical savanna climate, with hot temperatures above 30 °C throughout the year. Three distinct seasons exist. The wet season, which runs from January to April, is characterised by heavy downpours on an almost daily basis. Monsoon lows and tropical cyclones cause even more extreme rainfall, up to 200 mm (8 in) in 24 hours. The dry season, running from May to September, features hot and dry days; however, night-time lows are cooler and rainfall is almost non-existent. The build-up season, running from October to December, is oppressively hot and humid, with frequent days over 35 °C. Dewpoints in the wet season average 24 °C; in the dry season they average 18 °C. Rainfall during the build-up is infrequent, but when it does occur, it usually falls in brief, heavy downpours associated with severe thunderstorms. These seasons are not always set, however; sometimes the wet season can start as early as November or the dry season can extend as late as December, and monsoonal downpours have occurred as late as May. Extreme temperatures have ranged from 10.2 °C (49.3 °F) to 38.4 °C (101.1 °F). The highest daily rainfall recorded was 327.8 mm (12.9 in) during the passage of Tropical Cyclone Oswald in January 2013. The present town was constructed mainly by Comalco (now called Rio Tinto), a large aluminium company, which began making trial shipments of bauxite to Japan in 1962. A railway was constructed to transport the ore from the mine at Andoom to the dump of the export facility at Lorim Point. The bauxite mine is the world's largest with planned expansions increasing the margin over other mines in 2010. There are two schools in Weipa. The Western Cape College is a government co-educational school; it provides early childhood (kindergarten), primary and secondary schooling. It is on the corner of Central and Eastern Avenues in Rocky Point (12°37′37″S 141°52′50″E﻿ / ﻿12.6269°S 141.8805°E﻿ / -12.6269; 141.8805﻿ (Western Cape College)). In 2015, the school had an enrolment of 1,073 students with 93 teachers (90 full-time equivalent). St Joseph's Parish School is a Roman Catholic co-educational primary school at 2 Boundary Road, Rocky Point (12°37′45″S 141°52′49″E﻿ / ﻿12.6293°S 141.8802°E﻿ / -12.6293; 141.8802﻿ (St Joseph's Parish School, Weipa)). Opened in 2016, the school only offered enrolment in years P-3 but expects in 2018 to be able to offer enrolment across all primary levels (P-6). Weipa has a visitor's centre, swimming pool, bowling green, golf club, tennis and squash courts. There are netball and basketball courts as well as football fields. Weipa Town Authority operates a public library at Hibberd Drive in Weipa. At Nanum the shopping precinct has a Woolworths supermarket, bakery, coffee shop, travel agent, clothing shop, post office, newsagency / sports shop and butchers. There is also a chemist, camping and fishing store and within walking distance is a gift shop, furniture and whitegoods store, credit union and government social security office. At Evans Landing there are a hardware store and a number of mechanical workshops. ^ Australian Bureau of Statistics (27 June 2017). "Weipa (Urban Centre)". 2016 Census QuickStats. Retrieved 23 January 2018. ^ a b Penguin Books Australia (2002). Explore Queensland. Camberwell, Victoria: Penguin Books Australia. p. 60. ISBN 0-14-300015-2. ^ Australian Bureau of Statistics (31 October 2012). "Weipa (Urban Centre/Locality)". 2011 Census QuickStats. Retrieved 17 August 2016. ^ "Western Cape History". Weipa Town Authority. Retrieved 8 August 2018. ^ Massacres to Mining: The Colonisation of Aboriginal Australia, p. 34. Jan Roberts. 1981. Dove Communications. ISBN 0-85924-171-8. ^ Massacres to Mining: The Colonisation of Aboriginal Australia, pp. 115–116. Jan Roberts. 1981. Dove Communications. ISBN 0-85924-171-8. ^ Massacres to Mining: The Colonisation of Aboriginal Australia, p. 97. Jan Roberts. 1981. Dove Communications. ISBN 0-85924-171-8. ^ "Severe Tropical Cyclone Kathy". Bureau of Meteorology. 2011. Archived from the original on 19 March 2011. Retrieved 24 February 2011. ^ "Weipa Aero". Climate statistics for Australian locations. Bureau of Meteorology. April 2013. Retrieved 11 April 2013. ^ "Climate Statistics for Weipa, Queensland". Retrieved 7 November 2018. ^ "Western Cape College". Western Cape College. Archived from the original on 2 February 2017. Retrieved 22 January 2017. ^ "2015 School Annual Report" (PDF). Western Cape College. Archived (PDF) from the original on 2 February 2017. Retrieved 22 January 2017. ^ "Join Us". St Joseph's Parish School. Archived from the original on 2 February 2017. Retrieved 22 January 2017. ^ "School newsletter" (PDF). Catholic Education. Roman Catholic Diocese of Cairns. April 2015. Archived (PDF) from the original on 7 March 2016. Retrieved 22 January 2017. ^ "Hibberd Library". Public Libraries Connect. Archived from the original on 3 February 2018. Retrieved 2 February 2018. ^ "Weipa". Centre for the Government of Queensland. Archived from the original on 7 March 2011. Retrieved 17 January 2011. Moore, David R. 1979. Islanders and Aborigines at Cape York: An ethnographic reconstruction based on the 1848–1850 'Rattlesnake' Journals of O. W. Brierly and information he obtained from Barbara Thompson. Australian Institute of Aboriginal Studies. Canberra. ISBN 0-85575-076-6 (hbk); ISBN 0-85575-082-0 (pbk). USA edition ISBN 0-391-00946-X (hbk); ISBN 0-391-00948-6 (pbk). Roberts, Jan. 1981. Massacres to Mining: The Colonization of Aboriginal Australia. Dove Communications, Blackburn, Victoria. Rev. Australian ed. Previous ed: CIMRA and War on Want, 1978, London. ISBN 0-85924-171-8. Scarth-Johnson, Vera. 2000. National Treasures: Flowering plants of Cooktown and Northern Australia. Vera Scarth-Johnson Gallery Association, Cooktown. ISBN 0-646-39726-5 (pbk); ISBN 0-646-39725-7 Limited Edition – Leather Bound. 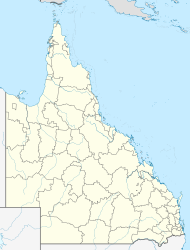 Wikimedia Commons has media related to Weipa, Queensland. This page was last edited on 5 January 2019, at 21:48 (UTC).